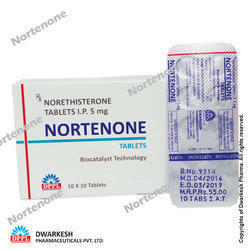 We are highly appreciated for offering precision-engineered range of Hormones Drugs. Under this array, we offer Hormonal Tablets to our patrons. Correctly formulated offered drugs in compliance with the defined parameters of the pharmaceutical industry as these are processed by professionals using high grade ingredients. Prior to dispatch, we make these drugs pass a quality test with the assistance of quality controller to ensure their ability to meet the requirements of patrons. MECHANISM OF ACTION:Norethisterone acetate converts the endometrium from the proliferative to the secretory phase. It may also have some estrogenic, anabolic and androgenic activities. The contraceptive effects are due to negative feedback inhibition of pituitary gonadotropin, whereby it prevents ovulation. Typical Usage: II generation progesterone. Have main progesterone activity and less androgenic activity. As contraceptive. 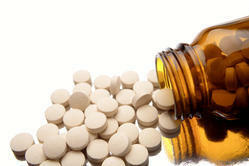 Hormone replacement therapy (HRT). Dysfunctional uterine bleeding. Endrometriosis. Premenstrual syndrome/tension. Threatened/habitual abortion. Endometrial carcinoma. Dysmenorrhea. Suppression of postpartum lactation. Hypoventilation. Mechanism of Action: Allylestrenol Once bound to the receptor, progestins like allylestrenol will slow the frequency of release of gonadotropin releasing hormone (GnRH) from the hypothalamus and blunt the pre-ovulatory LH (luteinizing hormone) surge. In women who have adequate endogenous estrogen, allylestrenol transforms a proliferative endometrium into a secretory one. Allylestrenol is essential for the development of decidual tissue and is necessary to increase endometrial receptivity for implantation of an embryo. Once an embryo has been implanted, allylestrenol acts to maintain the pregnancy. 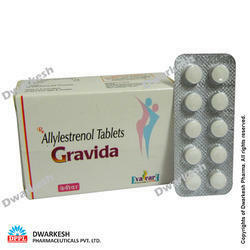 Allylestrenol also stimulates the growth of mammary alveolar tissue and relaxes uterine smooth muscle. It has little estrogenic and androgenic activity. 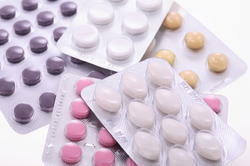 Typical Usage: Menopause (Hormone replacement therapy), Oral contraception. 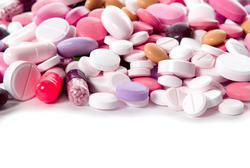 threatened or habitual abortion, dysmenorrhea, dysfunctional uterine bleeding, failure of ovarian development hirsuitism, senile osteoporosis, post menopausal osteoporosis, breast cancer, prostatic carcinoma, suppression of post partum lactation, senile vaginitis, delayed puberty in girls, acne (Not usually given). Mechanism OF Action: Estrogens enter the cells of responsive tissues (e.g., female organs, breasts, hypothalamus, pituitary) where they interact with a protein receptor, subsequently increasing the rate of synthesis of DNA, RNA, and some proteins. Estrogens decrease the secretion of gonadotropin-releasing hormone by the hypothalamus, reducing the secretion of follicle-stimulating hormone (FSH) and luteinizing hormone (LH) from the pituitary. MECHANISM OF ACTION:Aspirin is an analgesic, anti-inflammatory and antipyretic. It inhibits cyclooxygenase, which is responsible for the synthesis of prostaglandin and thromboxane. It also inhibits platelet aggregation.